Stop me if you’ve heard this one before: A sequel to a surprise hit tries its best to recreate everything everyone loved about the original but finds just how difficult it is to catch lightning in a bottle twice. However, because of the general good will the first movie built up for these characters and the universe they inhabit audiences probably won’t mind a lesser adventure from a second go-around. It’s a tale as old as Hollywood franchise filmmaking, observing the general rule that it’s far harder to please everyone when you no longer have the element of surprise. And Guardians of the Galaxy was surprising. A big-budget space opera featuring a talking tree and raccoon, based on a relatively obscure comic book, chiefly starring the chubby dude from Parks & Recreation, a former WWE champion and Zoe Saldana (easily the most well-established of the bunch thanks to Avatar/Star Trek) and directed by a Troma veteran mostly known for a couple of cult B-movies? Yeah, good luck with that. Cut to weeks after the film’s release: Hey, you know what movie really blew me away this summer? Guardians of the Galaxy! / I know, right? I have to find a Baby Groot toy immediately! It’s been nearly three full years since then, and while James Gunn and crew have plugged away at a sequel the rest of Hollywood has been busy trying to emulate Guardians. You can see the influences in our rock song-addicted trailers, or on the soundtracks of movies like Kong: Skull Island. Last year, it was almost embarrassing to see how desperate Suicide Squad was to be DC’s Guardians. But the time for knock-offs and cheap imitations is over. The original recipe Guardians of the freakin’ Galaxy are back, off to find Star-Lord’s dad and…actually, that’s pretty much the whole movie. Obviously, there’s a bit more to it, but GotG Vol. 2 is essentially just a movie about Star-Lord needing to find his actual family (as personified by his father, effortlessly played by Kurt Russell) to realize he already has all the family he needs with the Guardians. Side adventures with returning villains Yondu and Nebula also inevitably return to this theme of family since Yondu raised Star-Lord and Nebula and Gamora were raised as sisters. It’s the sequel you’d expect since the first film ended with an implicit promise that our next adventure would revolve around Star-Lord’s dad, but the execution is lacking because there’s just something slightly off about this whole movie. Yes, it’s a lot of fun. You’ll likely walk away having been sufficiently entertained. But there are multiple extended jokes, dramatic monologues and scenes which feel oddly forced as if you can see James Gunn up there on screen trying to perform some complicated calculus equation which will not only perfectly recreate a beloved tone but also result in everyone getting everything they want from the movie. And it was super fun and I’ll probably see it again. Wait, what? Talk about whiplash. The movie is flawed, yet you want to see it again? Make up your mind, man. 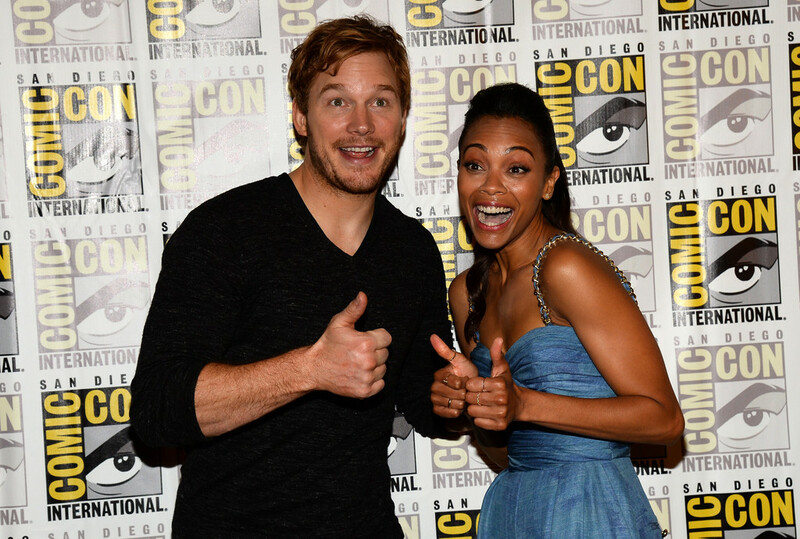 PRO: It’s fun to be in the Star-Lord, Gamora, Drax, Rocket and Groot’s company again. CON: There’s less substantive time spent with them and more dramatic work devoted to newbies like Mantis (an innocent, sheltered empath in the employ of Star-Lord’s dad) as well as returning villains Yondu and Nebula, who are now quasi-heroes. Plus, I hope you really wanted to see and learn more about The Ravagers because they are all over this movie. With such an expansive cast it proves difficult to give all of the actual Guardians interesting dramatic arcs of their own. PRO: It’s a visual treat for the eyes. From the opening scene featuring a digitally de-aged Kurt Russell to a closing fireworks display in space, Guardians remains the delightfully candy-colored wing of the Marvel Cinematic Universe. CON: But the visual are almost too much, too weightless, too CGI. 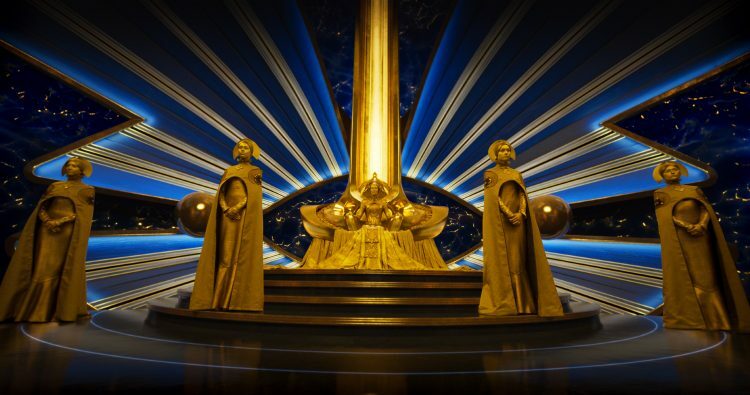 Moreover, the inciting incident of the plot involves Rocket stealing from gold-colored aliens the Guardians were hired to protect, and while it is initially obvious that Elizabeth Debicki is playing their leader and a bunch of no-names the lackeys the moment she loses her crown it’s hard to tell her apart from anyone else. This might seem nitpicky or insignificant, but it proves crucial in the final act. More importantly, since these aliens remote-pilot all of their ships and thus never actually leave the one big room we see them in, let alone their planet, there’s no real resolution to their conflict. They are simply there to be a nuisance to the Guardians, and then probably to come back as villains in the next movie (or in Captain Marvel or Infinity War). PRO: You’ll laugh a lot, particularly during one action sequence in the woods where Rocket…well, I can’t give it all away, can I? PRO: The old school jams are toe-tapping fun as in I literally tapped my toes do some of the throwback beats courtesy of Fleetwood Mac, Sam Cooke, Looking Glass, Cheap Trick and Cat Stevens. CON: But don’t add much to the action and aren’t as organically incorporated. Plus, the best songs are actually saved until the closing credits, as if James Gunn really wanted us to dance in our seats while sitting through the credits in anticipation of the 5 post-credits sequences. CON: But the plot takes way too long to come together. The movie doesn’t even decide what it’s actually about until the third act. PRO: Baby Groot is adorable. He definitely steals the show. CON: But he doesn’t get as much to do as you’d expect. PRO: The post-credit sequences are mercifully short and cleverly interspersed throughout the credits. CON: But are sure to disappoint if you were hoping for some Infinity War set-up. Guardians of the Galaxy Vol. 2 is an imperfect sequel, but when the characters are this fun to be around and action sequences continually engaging you won’t mind a slightly lesser second go-around with these bunch of a-holes.